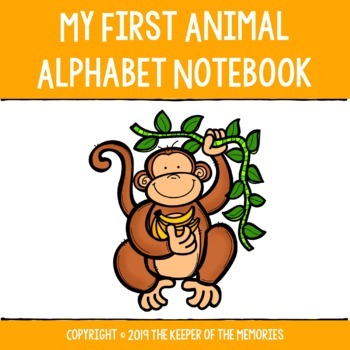 My First Animal Alphabet Notebook for Pre-K/Kindergarten. Kid-tested! Little kids love animals and this My First Animal Alphabet Notebook is the perfect way to teach them the alphabet! Each letter includes an alphabet page and an activity page. Alphabet pages include the letter and an animal that starts with that letter. Activity pages include coloring, tracing, and writing the letter. And of course there's also a fun activity for each one! I created two different covers for this notebook - one color and one black and white, so that you can choose between the two. Or if you prefer to use a three-ring binder, you'll have a color cover for the outside and a black and white cover for the inside.